The pattern is a sequence of three Doji. The occurrence of this pattern is extremely rare so when it occurs it should not be ignored. 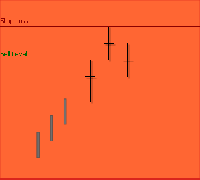 The Bearish Three Star consists of three consecutive Doji in which the second Doji gaps above the two other Doji. It is sufficient that the gap is a body gap. There is no need for a gap between shadows. In the case of a Bearish Tri Star we have a market which is in an uptrend for a long time. However the weakening trend is probably indicated by the bodies that are becoming smaller. The first doji is a matter of concern. 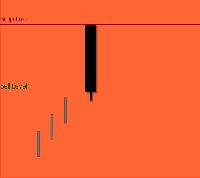 The second Doji clearly indicates that market is losing its direction. Finally the third doji warns that the uptrend is over. This pattern indicates too much indecision leading to the reversal of positions. The confirmation level is defined as the last close. Prices should cross below this level for confirmation. The stop loss level is defined as the higher of the last two highs. Following the bearish signal if prices go up instead of going down and close or make two consecutive daily highs above the stop loss level while no bullish pattern is detected then the stop loss is triggered. The market opens higher with a significant gap in the direction of the prevailing uptrend. So the first impression reflected in the opening price is the continuation of the uptrend. However after the market opening things change rapidly and the market moves in the opposite direction from there on. This causes much concern among the bulls leading them to sell many positions which could reverse the direction of the trend and start a sell-off. The confirmation level is defined as the last close. Prices should cross below this level for confirmation. The stop loss level is defined as the last high. Following the bearish signal if prices go up instead of going down and close or make two consecutive daily highs above the stop loss level while no bullish pattern is detected then the stop loss is triggered. 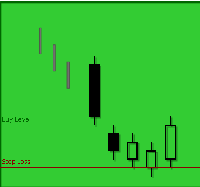 Bullish Belt Hold is a single candlestick pattern basically a White Opening Marubozu that occurs in a downtrend. It opens on the low of the day and then a rally begins during the day against the overall trend of the market which eventually stops with a close near the high leaving a small shadow on top of the candle. If longer bodies characterize the Belt Hold then the resistance they offer against the trend will be even much stronger. 2. The market gaps down and opens at its low and closes near to the high of the day. 3. A long white body that has no lower shadow (a White Opening Marubozu) is observed. A White Opening Marubozu or a White Marubozu (with no upper or lower shadow) should be seen in a Bullish Belt Hold and it should open lower than the two preceding black candlesticks. The market opens lower with a significant gap in the direction of the prevailing downtrend. So the first impression reflected in the opening price is the continuation of the downtrend. However after the market opening things change rapidly and the market moves in the opposite direction from there on. This causes much concern among the short traders leading to the covering of many positions which could reverse the direction of the trend and start a rally for the bulls. The confirmation level is defined as the last close. Prices should cross above this level for confirmation. 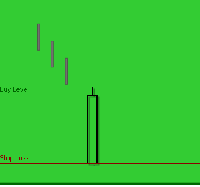 The stop loss level is defined as the last low. Following the BUY if prices go down instead of going up and close or make two consecutive daily lows below the stop loss level while no bearish pattern is detected then the stop loss is triggered. 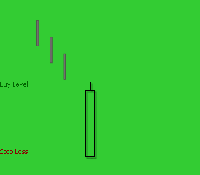 This candlestick implies normal selling pressure and shows that prices declined during the day from open to close and the sellers were in control. 1. The body of the candlestick is black with normal length. This candlestick represents extreme bearishness and is characterized by a long black body having no shadows on either end. 1. The body of the candlestick is black and long. 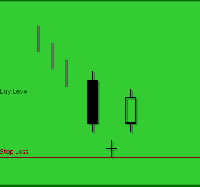 The black body of the candlestick should be longer relative to the other candlesticks on the chart. Shadows should not exist. A Black Marubozu forms when the opening price is equal to the high of the day and the closing price is equal to the low of the day. This shows that the sellers controlled the price action from the first trade to the last trade. The day opens and prices continue to move down all day without stopping thus forming a long black day with no upper shadow. The day also closes at the low of the day with no lower shadow. This candlestick is generally bearish. However its position within the broader technical picture is also important. It may show a potential turning point and suggest that prices have reached a resistance level after an extended rally. If it is seen after a long decline it may signal panic or capitulation a final sell off attempt before bulls regain control. Still the candlestick alone is not reliable enough to decide about the direction of the markets since it reflects only one day's trading. 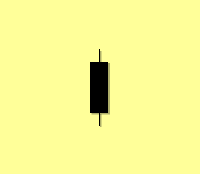 This five candlestick pattern starts with a strong black candlestick. The next three days after the downside gap set consecutively lower prices. However the last day completely erases the limited losses of down days and closes inside the gap between the first and second days. This suggests a short term reversal. 1. The color of the first strong black day represents the current downtrend. 2. The second day is also black and the body gaps in the direction of the trend. 3. The third and fourth days continue the trend direction. It is better if the third day is white but it may also be black as the fourth day. 4. 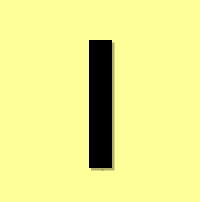 The fifth day is a white one that closes inside the gap formed between the first two days. 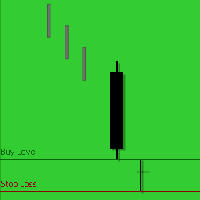 The first black candlestick of the Bullish Breakaway should not be short. However the following three black candlesticks after the gap can be short while the third candlestick in the middle can be white too. The last white day should close inside the gap but should not close the gap.